Raven’s Loft presents a unique line of jewelry inspired by the symbolism found in Old World Witchcraft, old lore and an enchanted world view. We know these beautiful amulets, talismans, and charms will speak to the spirit of the Seeker of the Old ways and bring to the wearer everyday enjoyment. If you are looking for a special symbol let us know and we will find it for you. This handsome piece is an exclusive to Raven's Loft. In ancient mythology, symbolic amulets were believed to protect the wearer from negative forces. Chain - Sterling Silver Chain-2 mm Wheat - 20"
The Wheat chain is a sturdy and beautiful weave of 20" sterling silver and can be worn by itself or with a pendant, of course! Use this rouge cloth to polish and keep clean all of your sacred and ritual jewelry, brass, gold, or silver objects. Pendant - Cimaruta - "The Witch's Charm"
Our original design by artist Maxine Miller of our traditional sterling silver 2-sided Cimaruta talisman, also known as the "Witches’ Charm". It is created as a part of the Grimassis' Crossroads Collection. Incorporating the Planetary Signs by the lines of fate, this amulet is worn to open up windows of Opportunity and to promote Happiness and Good Fortune. Wear this key to claim your power and open doorways to spiritual evolution. "The Key to the Mysteries" pendant is a Raven's Loft exclusive design. 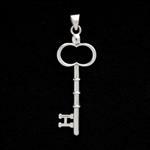 The Key denotes its wearer as one who can unlock the inner mysteries and enter mystical pathways. 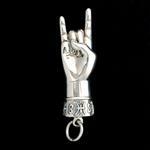 "Mano Cornuto" Charm or "horned hand" - Made especially for our line of Crossroads Collection jewelry. 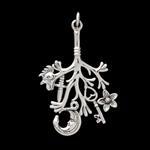 Awesome 3-D heavy sterling silver " a charm that protects against ill will and wishes of others. This is very cool! A large coil that expands into a spiraling design that can be used to hold small charms or stones, roots, gems, shells. 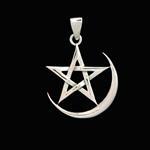 This simple but elegant Crescent Moon Pentagram is crafted of sterling silver. A reminder that you can unlock and lock doors at will. We always go to one of our favorite antique stores and purchased these vintage or antique skeleton keys. A reminder that you can unlock and lock doors at will.